How to add a logo to your flipbooks. What is a logo? A logo is an image or another small design adopted by an organization to identify its products. Having one in your flipbooks will make a lasting positive impression. The steps to adding one are very easy, all you have to do is to go to the Customize section and on the left side select Your logo in widget . 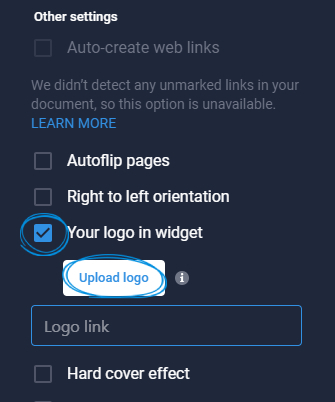 An Upload logo button will appear. Just click on it, upload your logo and publish the flipbook. 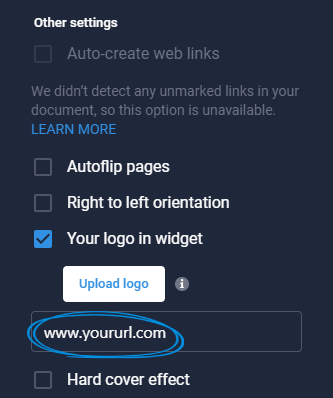 If you want to send your readers to your website when they click on the logo, all you have to do is add the the link to your website in the Logo link container. Important: For best results, we would recommend you to use a PNG or JPG file with maximum 2 MB in size. The resize will be automatically made by us so the display size will be maximum 100 x 100 px. Let us know your thoughts about this feature on the live chat!